NDPL online bill payment Delhi: ‘North Delhi Power Limited’, it is an electricity service and the former name of TATA Power Delhi Distribution. As the name mentions it is power supply organization. It supplies electricity to whole Delhi. Their works do not stop there, they also provide the number of services to their consumers. Online Bill payment is one of those services. You can check more detailed help on the official website. We all know how difficult is to spending time for bill payments by standing in a queue for hours. While NDPL bill payment login is giving facility of online bill payments to their consumers then why to choose any other option for this. We all are aware of electricity important in our lives. One cannot even imagine life without electricity. Just because that darkness not become in our lives, this type of electricity providers works at their best. TATA Power DDL was founded in 2002 by TATA Power and Govt. of NCT of Delhi. It is a public-private merger company where 51% of shares held by TATA Power while resting of 49% held by Delhi Power Company Limited (Government of NCT). Headquarters of the company is located in New Delhi, India. Here we will discuss how you can pay your NDPL bills online by following few steps. You can drop your cheque for bill payment at Skypak DropBox. You can also drop the cheque at Axis Bank ATM drop box. You can use the ECS system to a payment of bill where amount will directly debit from your account. You can make the payment by a call on 011-49165555 by your mobile or fixed line. If you are an Airtel Mobile user then with Airtel Money utility, you can able to pay your NDPL bill. You can also make payment through NEFT/RTGS pay directly from your bank account in favor of TPDDL. There are machines available for anytime payment in TPDDL offices, you can also use them to make payment. Above all options and more are available for NDPL bill payments. You can choose any of them as per your availability and requirement. 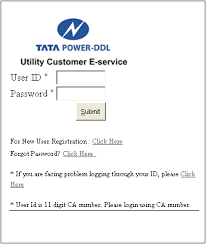 As a consumer of TATA Power DDL, you can easily make your bill payments online. By simply follow below-given steps to Login your NDPL account, you can pay your bills. Open the official website of the company that is www.tatapower-ddl.com in your favorite browser. Choose the online bill payment option available on home page. User ID and Password are mandatory fields you have to provide. To Login your NDPL account enters the User ID that is your 11 digits CA number that you can find on your bill. The password is what you have chosen at the time of registration. Enter the same. Once providing correct User ID and Password, click the ‘Submit’ button for successful Login to your NDPL account. What if you are a new user? Do not worry about, just click on the link ‘For New User Registration: Click Here’ that will take you to the registration procedure. Once you complete it, you can also able to Login your NDPL account for online access. Lost your password or forgot it? Do not worry just click the link ‘Forgot Password? Click Here’ to retrieve. See, how much time it takes to Login your NDPL account for online bill payment, very less. And in this very less time, you can able to do many things to manage your account not just bill payment. Let’s see what you can able to do with Login NDPL. You can easily pay your NDPL bill online. You can able to download duplicate bill copy. For your reference or any other use, you can download last E-payment receipt of your bill. With Customer Number (CA) that you can find on your Bill, you can locate your nearest payment center. You can have 'confirmation slip' of your last payment. You can able to check your outage status. You can view your billing history anytime. You can able to analyze your usage. Enroll for receive mail and text alerts. You can manage your account easily.